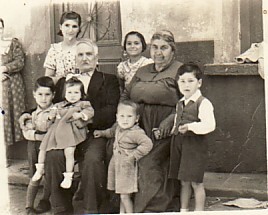 Above: Her parents, Ioannis and Eleni, and some of their grandchildren. Above Right: Melinda Beach. 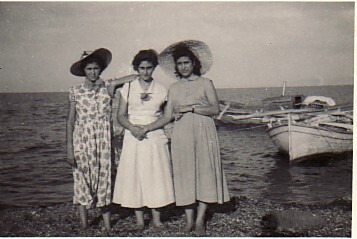 With Evangelia Halaka (middle) and Mersina Loupou (right). Above Right: Migrating to Australia. Paradisia is sitting on the right, while Mersini Markou is on the left. 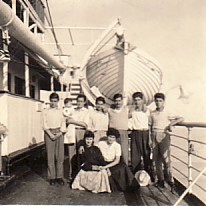 Standing are: Spyros Malamas (Dimitriou)- first from the left, and Apostolos Malamas (Paradisia's brother) is third from the right. 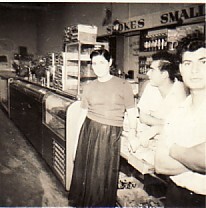 Above: With her husband, Grigorios Zadellis (middle) and her brother, Spyros (right). Above Middle: With her husband, Grigorios. 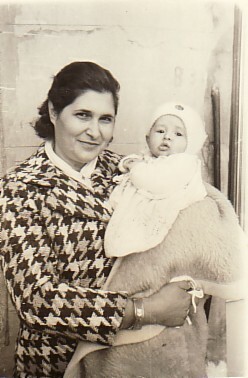 Above Right: With her daughter, Jenny.